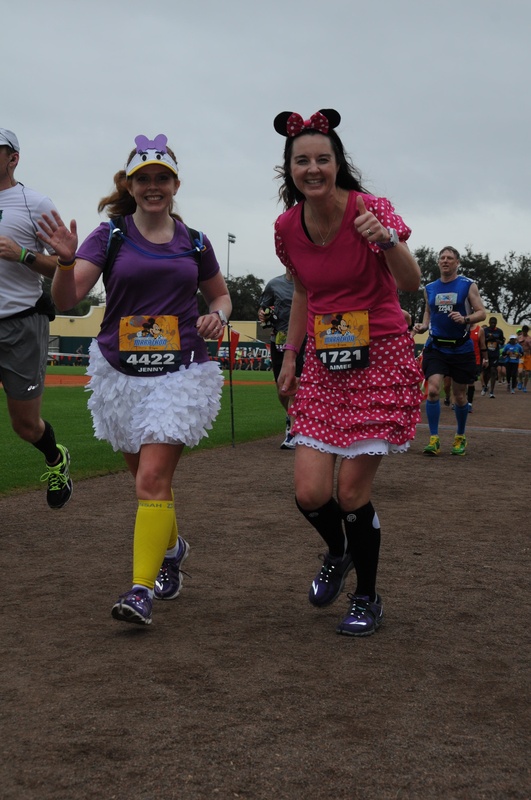 During last year’s Princess Half Marathon, Aimee and I concocted a crazy plan: to run the full marathon at Disney World in 2015. 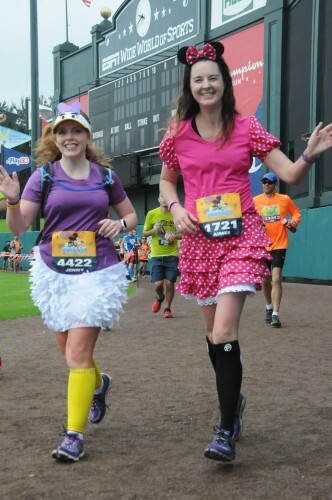 We’ve been doing this distance running thing for a few years, so we figured our legs could handle the marathon by now. And you know what? We were right! 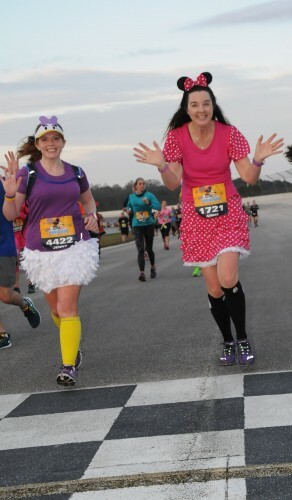 We headed to the expo on Saturday to get our bibs and stock up on RunDisney merchandise. 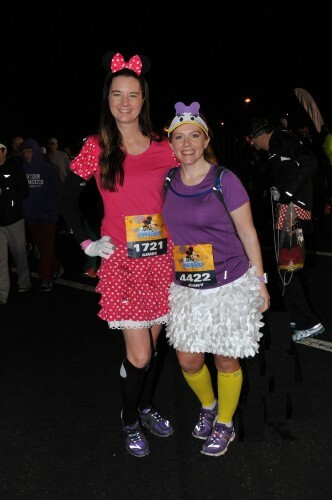 On Sunday, we got up at the usual 3AM and put on our running costumes – Disney BFFs Minnie Mouse and Daisy Duck! 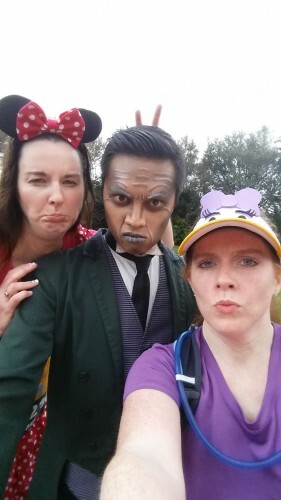 We made our way to the shuttles around 4:15 and ended up with the greatest bus driver in history who got us to the Epcot parking lot from the Boardwalk in 15 minutes flat. Seriously record time! 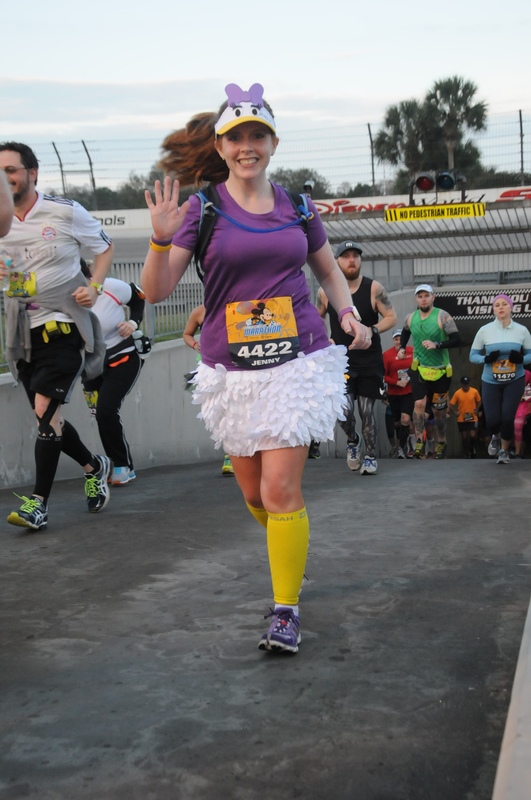 We hit the porta potties one last time and started the looooooong walk to the corrals. 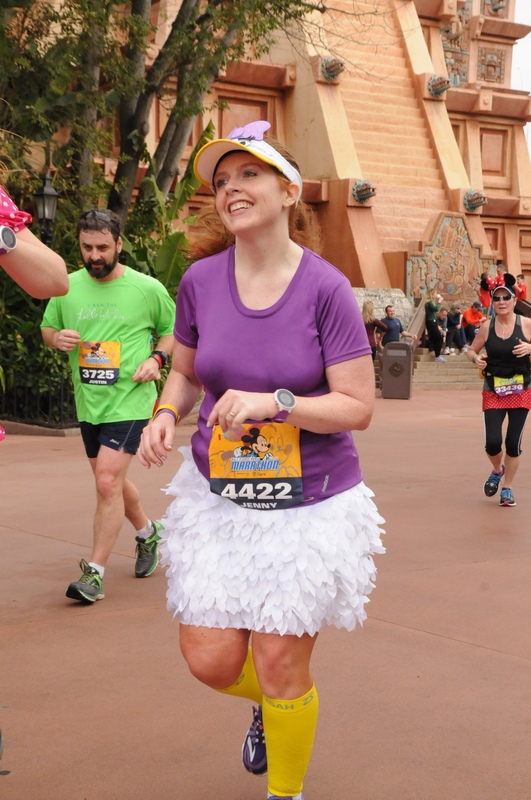 I was in Corral I, so we stupidly followed Disney’s sign to go straight when the road split (A-H went to the left, I-P went straight). That put us all the way back at Corral M or something and we then had to walk ALL the way back to Corral I, only to find it was double barricaded and we would have to walk up to H to get through the first barricade. Annoying. 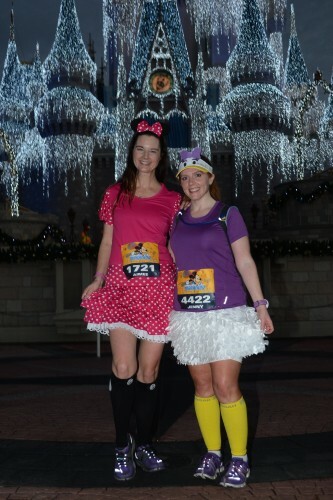 But we just jumped over it and made it over to the corral where like 6 people checked our bibs. Love the corral police keeping out the riff-raff! 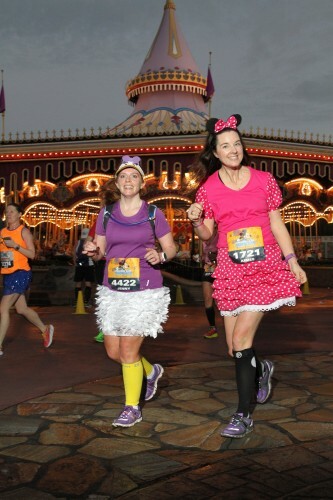 A few minutes after 6AM, we were off and running and in the Magic Kingdom before we knew it. Then we were on our way to the Speedway. There’s a little hill going into the Speedway tunnel, but it’s not as bad as everyone makes it out to be. Once you get about 1/2 way around the track, there’s race cars, classic cars, and muscle cars lined up on the embankment. Aimee and I are both car geeks so we really enjoyed this part. A lot of the car owners were out of their cars cheering us on, which was really cool. I’ve heard they sometimes don’t cheer or just sleep in their cars, so we were pleasantly surprised. Feeling good so far! Then we made our way by the infamous Water Treatment Plant on our way to the Animal Kingdom. I’ve heard/read that this part is long and boring, but I think Disney must have heard the same thing and stepped up their game in this department. 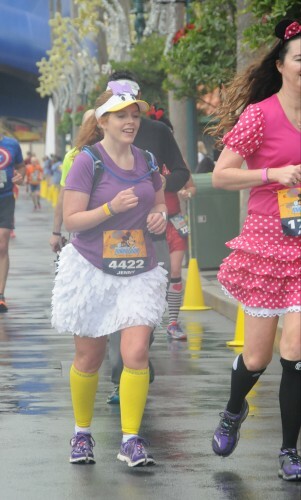 I don’t think we went a quarter mile without entertainment of some sort or a water stop. Also, is this part a hill? It felt like a hill. Anyway, we made our way passed the acrobats, guys on stilts, funky water treatment plant (it only lasts a minute, though! 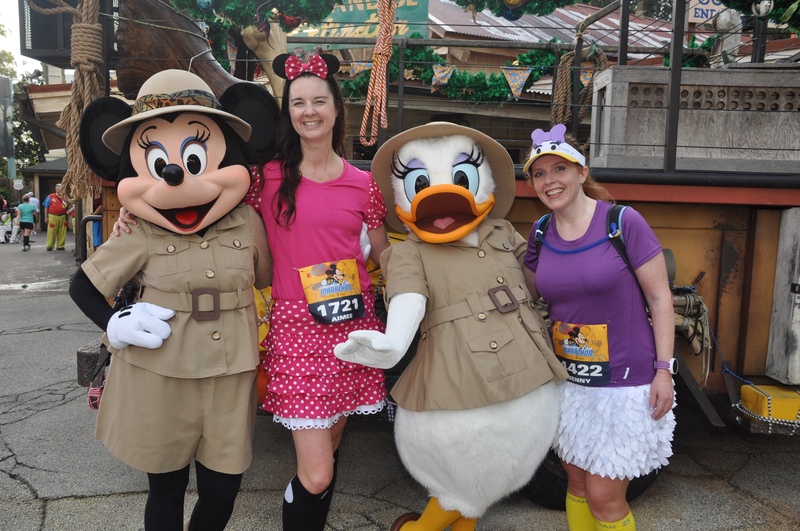 ), and into the park where we found MINNIE AND DAISY!! TOGETHER!! We went through our first Clif Shot station after that which gave us a nice little jolt to get through the Wide World of Sports. 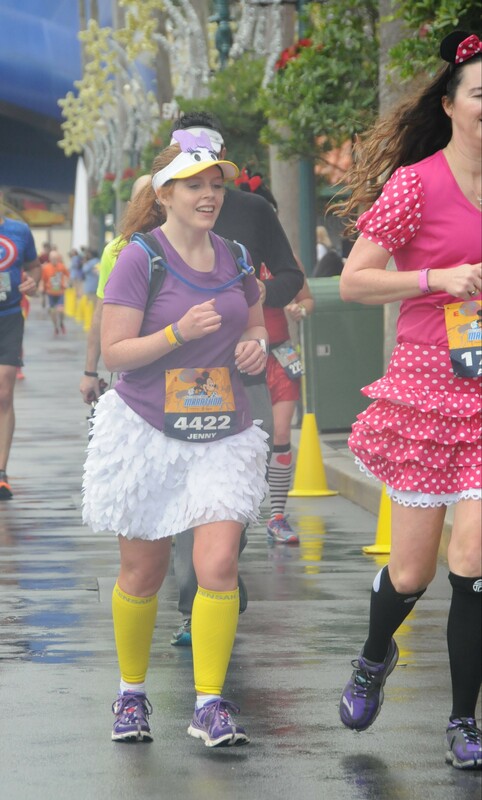 But the part right after the Sports Complex is tough even though it’s only two miles to the Hollywood Studios. I actually started having chest pains through here, which scared the crap out of me. 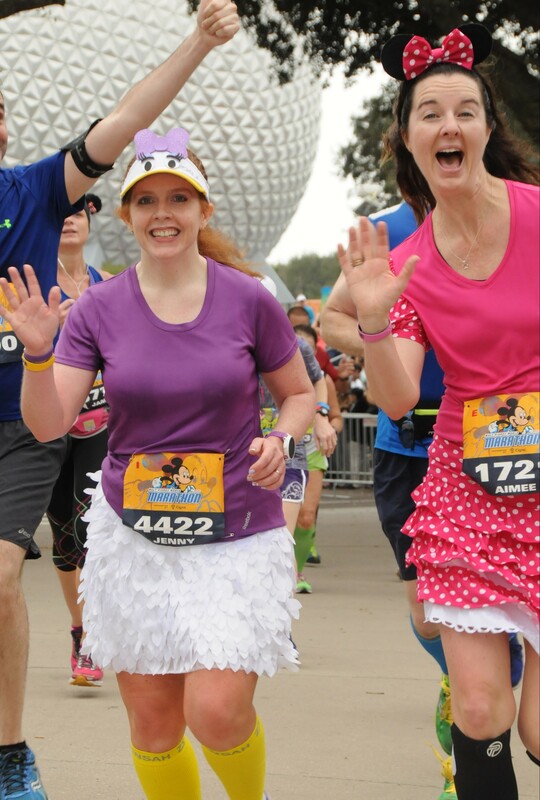 Disney somehow knew this would happen and had a medical tent just as the pain started. Man, they are good. Aimee was (outwardly) cool as a cucumber and suggested that I loosen my sports bra hooks. That girl is a genius! Turns out, I had swollen throughout the morning and just needed to give the girls some breathing room. I was totally fine after that. 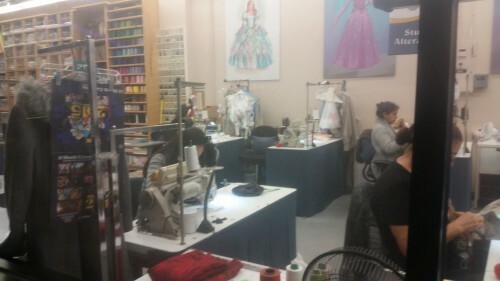 Then my heart was all aflutter for a different reason: we were heading into the costuming tunnel at Hollywood Studios! Such a bummer since the Sorcerer’s hat was GONE forever two days later. I think it was in the Studios or Animal Kingdom that a cast member said to me, “Great job, Jenny! Happy belated Birthday!” Wait, what? How the hell did she know that? My name is on my bib, but how did she know I just had a birthday? I was seriously bewildered at that one. But it was also around this time that we realized we’ve got this! We’re doing this! We’re about to finish a marathon! After a little spin around the Beach Club we grabbed a quick kiss from our hubbies and we were off to Epcot for the final stretch. Then we made our way through Future World and passed the choir as they were singing Our God Is An Awesome God which was “our song” back in the day at church camp. How does Disney know these things?! 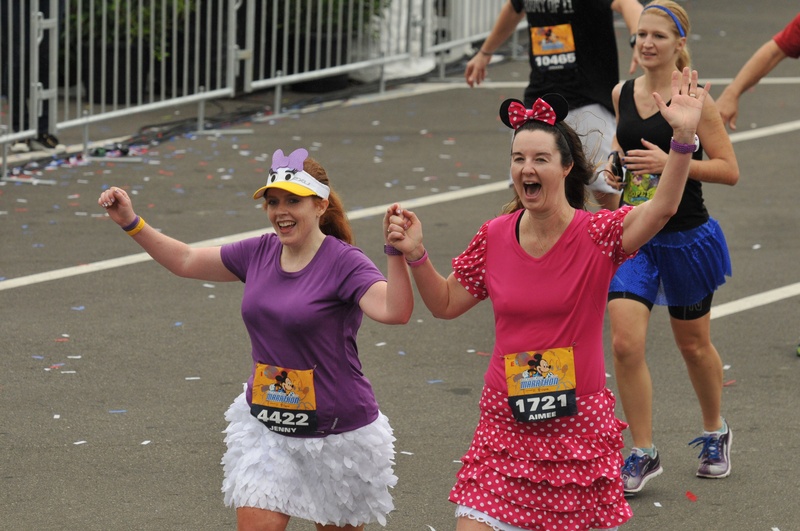 And just like that, we were approaching the finish line! 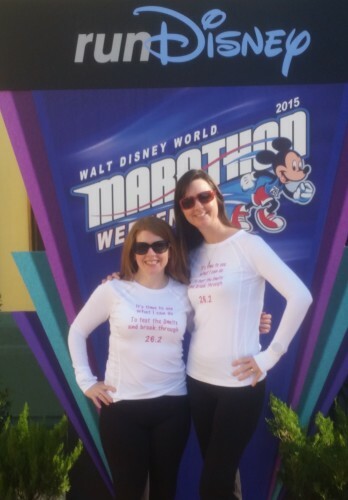 Being our first marathon, we had a main goal of just finishing, but our B goal was to finish in under 5 hours. With a whopping 17 seconds to spare, we came in at 4:59:43! 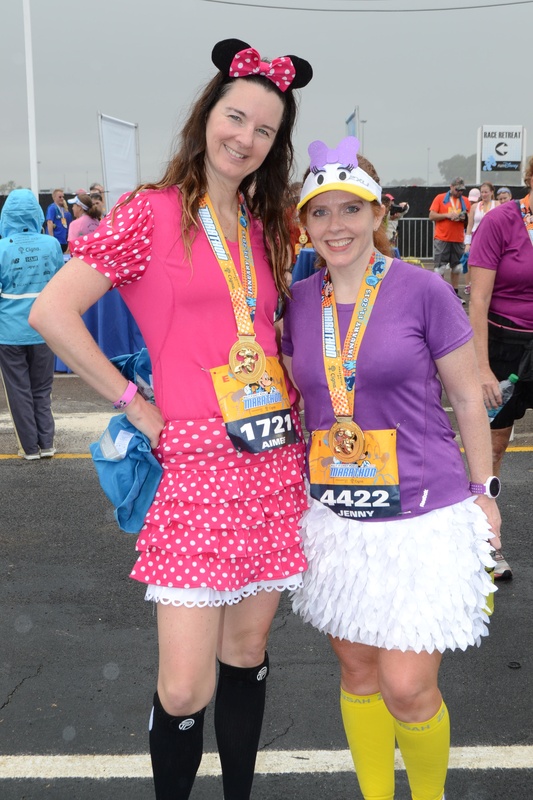 Considering all the stops for pictures and pit stops and wardrobe malfunctions, plus a reading of 26.83 miles on my Garmin, we were THRILLED with that time! And suddenly we were marathoners! 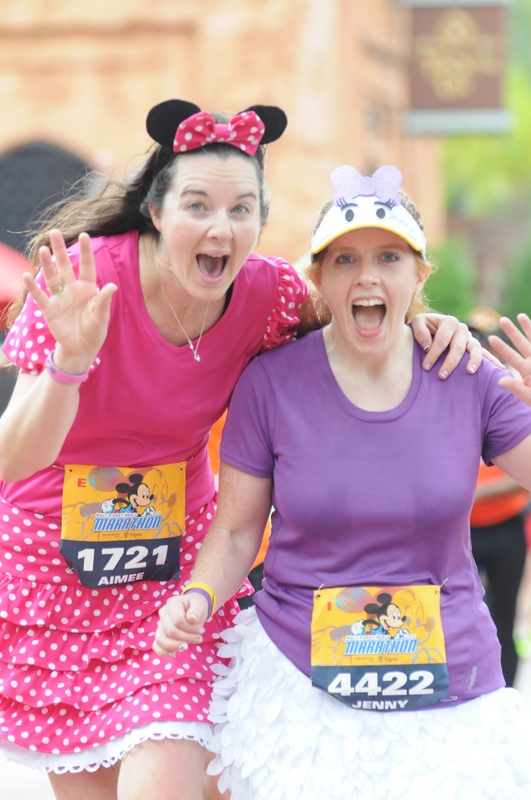 We had a BLAST running the marathon together and are already looking to run another one. And of course we will run more runDisney races because no one does it like Disney! This entry was posted in races, Running.